Working professionals from all walks of life – firefighter/paramedic, horse breeder, Realtor, nonprofit executive, dental hygienist, law enforcement, nursing, accounting a more than a dozen occupations – came Friday to share an important message with nearly 300 high school students: You can be whatever you want to be. The skills may vary, but students from Denair High School and Denair Charter Academy heard some consistent themes in a variety of career-based presentations Friday morning – work hard, get the best education you can, treat people with respect and follow your passion. Do that, they were told, and a satisfying and successful professional career can be had. It was all part of an informative and wide-ranging College and Career Fair at the high school. The point, explained Principal Kara Backman, wasn’t to direct teens down any particular path, but to open their eyes to many different possibilities. Students were able to sign up for three 20-minute sessions to listen, watch videos in some cases and ask questions. After lunch, more than two dozen representatives from local colleges and businesses set up booths in the gym, allowing students to browse and gather more information. One of the sessions featured firefighter and paramedic Kevin Gresham, whose wife, Cherie, is Denair High’s guidance counselor. 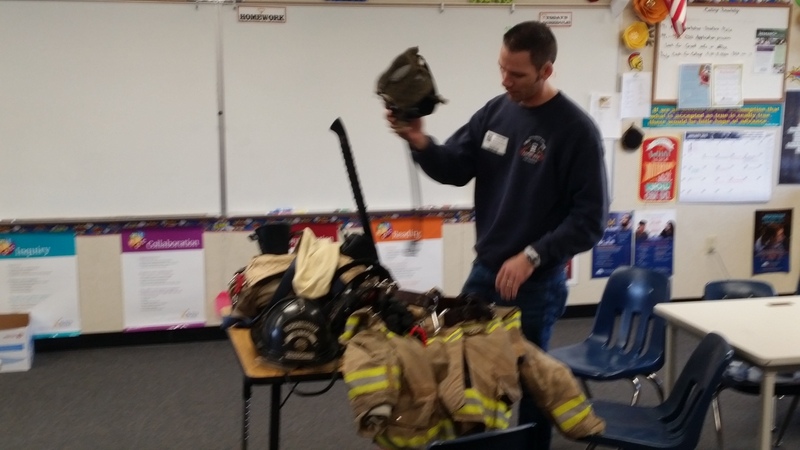 He told students he absolutely loves his job with the Sacramento Metro Fire Department, which requires him to work 48 hours straight and then have four days off. His only regret, he said, is that he didn’t start his training directly out of high school, instead taking about 18 months off. “At first, it was hard getting back into school after being out of it,” he said. He took fire safety courses at Modesto Junior College, then earned advanced certifications as an emergency medical technician (EMT) and then as a paramedic. Because of the number of medical calls most fire departments respond to, they virtually all require their employees to have at least EMT certification. Many will hire only paramedics, Gresham said. He said he worked for multiple ambulance companies and Cal Fire before landing the job with the Sacramento department about four years ago. 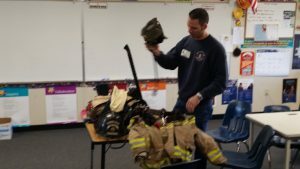 “Experience and education – both of them together will give you the most options,” said Gresham, who brought much of his firefighting gear to show students. “I love the job I get to do. You don’t different things every day, but it’s not easy. He said beginning firefighters start at $60,000 to $70,000 a year and the most experienced in the larger departments can make more than $200,000 annually. Money was a key motivator in Realtor Chris Nichols’ presentation. He told students that top real estate agents can make $500,000 to $1 million a year – but that the average salary is less than $20,000. The difference, he explained, is hard work and gaining the trust of clients (buyers and sellers). He went through an exercise in which students shook hands. He then told them he could evaluate their personalities based on their grip. “Over the top” shakers are dominant extroverts; straight, firm grip shakers tend to be analytical and fact-oriented; “under” shakers are Type C personalities and are easily influenced; and “dead fish” shakers are wishy-washy. “Don’t waste your time with them,” he advised. Getting people to like you, Nichols said, is understanding their personality and tailoring your behavior to match. Extroverts prefer a dynamic exchange, analytics like a more moderate monotone conversation and Type C’s respond well to suggestion. “Mimic the person 50% of the time so they’ll like you,” he suggested. Real estate, he said, is all about building relationships. The day began with a motivational talk from Aaron Hunnel. He is a U.S. Army veteran, business owner, author and endurance athlete who believes that people are the greatest gift in life. After returning from his second deployment, he told Denair students, Hunnel struggled to find meaning, hit rock bottom and life gave him two choices: stay down or get up. He chose to move upward once he found and harnessed a personal power through endurance running. Along his journey, he met a friend afflicted with cerebral palsy, and together, they began racing as he pushed and pulled her through running and triathlon events. Through their relationship, he told students that he learned what authentic happiness truly means, and how we can work together to press play on life.